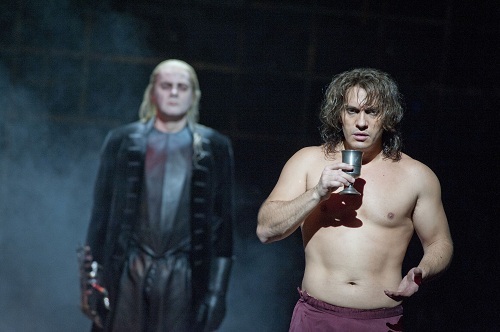 Most modern productions of Don Giovanni unsurprisingly highlight the work’s moral messages, and Francesca Zambello’s production (the revival directed by Bárbara Lluch) is a champion of this directorial tendency. As the curtain rises on the monolithic wall that serves as the entire production’s main set piece (a wall that, of course, is haphazardly plastered with Christian iconography), the stage is oppressively filled with smoke. This drab, serious setting undoubtedly is intended to complement what Zambello would probably call the “serious” action on-stage. Despite our post-Foucaultian attitude, in their capitalistic haste to create something “moving” and “artistic,” directors easily forget that an emphasis on moral seriousness is a product of twentieth-century hermeneutic zeal and, furthermore, that century’s modernist preoccupation with the absolute. While this perspective is perfectly appropriate for the first-timer, most of us yearn for a production that gives audience members some room to create ambiguity, not one that uses performers to propagate, or better, force-feed a thoroughly exhausted message down our throats. Perhaps the only positive aspect to emerge from this directorial tyranny was the performers’ instinctive resistance to it. The first act was dull: one could feel the ennui in the air. But the moment the second began, the entire hall was filled with hitherto lacking electricity. The vocally dark hued Ruxandra Donose, as Donna Elvira, was simply angry—one-dimensional at best—save the moments during her striking “Mi tradi quell'alma ingrata,” which was vocally unassailable, breathtaking. One wished for the same commanding quality in the seria couple, Don Ottavio and Donna Anna (respectively, Pavol Breslik and Carmela Remigio), both who often seemed like static entities. Remigio’s voice has an edge that needs a bit of softening; in this production, though (which, in addition to highlighting morality, focuses on feminine power) it may have been perfectly well-suited, especially in her lukewarm yet very moving “Non mi dir.” Breslik sang his arias extremely well, and managed to spin his beautiful phrases into the house with little effort, creating a Don Ottavio that is sensitive and, as the dénouement demands, lame (something that may have been avoided if he had given just slightly more power to his chest voice in the upper range). As Zerlina, Kate Lindsey was charming and incredibly entertaining; one feels slightly excited each time she appears on-stage to sing. As Masetto, Matthew Rose had a wonderful rapport with Lindsey, and sang the role with great attention to detail and (refreshing) comedic timing. Reinhard Hagen sang a very powerful Commendatore, though his famous scene with the Don could have been taken significantly slower. Nevertheless, conductor Constantinos Carydis’s accompanied the singers brilliantly, though the orchestra did sound considerably worse for wear at times. It’s true: Don Giovanni’s moral layer will never (and, to be clear, shouldn’t) be wholly forgotten, but one was aware of alternatives while watching Erwin Schrott as the mischievous Don. Schrott’s interpretation is flamboyant, charming, and insightful; his resilient Don fought Zambello’s restrictive idiocy by breaking the fourth wall and directly addressing (seducing) a lucky audience member, encouraging a cacophony of laughter. Simple, small, and, of course, comic gestures like this one subvert the tendency to always read Don Giovanni as a serious moral tale. Vocally, Schrott is incredible; his voice was at its best, lyrically, during the famous “Deh vieni alla finestra;” he deserves credit, though, for also handling expertly his recitatives, and he did so at no better time than during his scenes with Alex Esposito, the evening’s Leporello. Esposito’s comic timing was brilliant, and he sang the role with verve rarely found. Both men created phenomenal rapports with the other singers, and all should be commended on that count. This cast brings an admirable amount of life to Zambello’s all too serious production: they curiously resist its exhausted layers of meaning with combative and, indeed, at times, magnificent artistry.